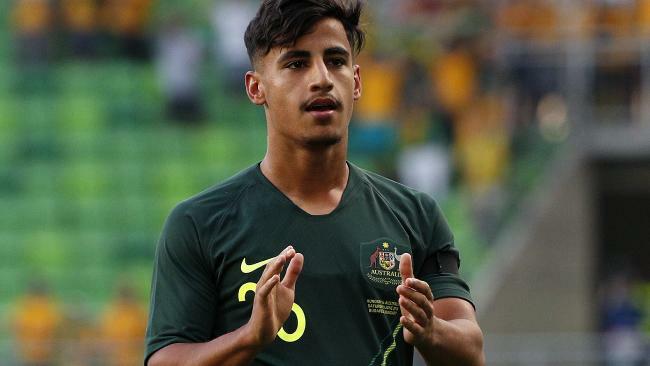 SOCCEROOS revelation Daniel Arzani is reportedly close to agreeing to a lucrative deal with English giant Manchester City. The Premier League champions have reportedly streaked ahead of Euro rival Juventus in their tug-of-war for the Aussie talent, just a couple weeks after it was revealed the two powerhouse clubs were chasing the Melbourne City star's signature. Arzani remains a chance to play alongside megastar Cristiano Ronaldo, with Juventus linked earlier this week to a bombshell play for the Real Madrid superstar. However, a new report from SBS indicates the 19-year-old Aussie is on the brink of agreeing to a three-year deal with Manchester City - Melbourne City's parent club. The report indicates the City Group has already outlined its plans to Arzani to immediately loan him out to another European club after he signs with them - following the exact same path Aussie midfielder Aaron Mooy took when he left the A-League. Daniel Arzani has the world at his feet. The World Game reports City is considering loaning Arzani to Dutch sister club NAC Breda or to Club Brugge in Belgium. He could also be re-loaned back to Melbourne City - as publicly preferred by Melbourne City coach Warren Joyce, who has said he wants Arzani to remain in Melbourne for one more season. If Manchester City is able to lure him away from its Italian rival, the English club will cough up $500,000 to its sister club in Melbourne as a transfer fee, according to the report. Arzani said after Australia's World Cup exit that he would be flying directly to London to meet up with manager Frank Trimboli in a bid to sort out his future. However, The Sun reports Juventus is still very much in the mix to win Arzani's signature. Arzani could follow a similar path to Mooy, who also made the Etihad switch from Melbourne in 2016. Mooy, 27, has been linked with a move back to City after his successful £10m transfer to Huddersfield Town, but the club has denied the claims. Arzani is the Australian Young Player of the Year and according to the Manchester Evening News, City is aiming to make him part of a worldwide talent recruiting network. City owns clubs in America, Australia, Spain, Japan and Uruguay, as well as their crown jewel at the Etihad, and could use the network to make the Arzani transfer happen. Chief executive Ferran Soriano is said to treat player recruitment as a venture capital exercise and wants to adopt a model similar to Barcelona's, where the youth academy has produced a string of established first-team stars. The Iran-born playmaker was the youngest player to travel to the World Cup in Russia, making a particularly impressive cameo off the bench in a 1-1 draw with Denmark. 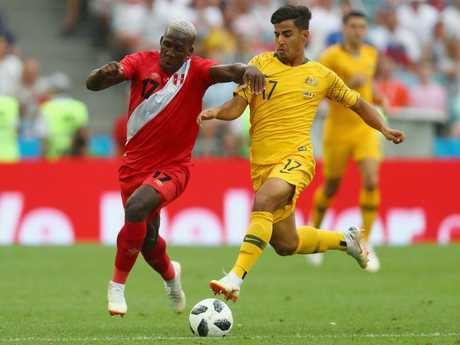 That performance drew comparisons with Sergio Aguero and Alexis Sanchez, but Australia was knocked out in the group stages for the third straight World Cup after losses to France and Peru. Former Socceroo Ljubo Milicevic believes Arzani is Australian football's best young talent since Harry Kewell and should get out of the A-League as soon as he gets the chance. Milicevic said: "As soon as possible go to Europe. "Do not waste any more time in Australia. "I don't know what opportunities he has and who looks after him, but the sooner you put yourself in Europe, the better you are going to be."